Nepeta Cataria is a herbaceous species belonging to the Lamiaceae family. With European origin, it’s currently growing worldwide spontaneous. This perennial herb is high around 50-100 cm, with heart-shaped and toothed leaves and white small flowers with red spots, which bloom during hot periods of the year. Catnip (one of the common names of this plant) has many effects on our domestic cats, most of them exciting, but it has actually many beneficial properties on humans. In traditional medicine, infusions extracted from catnip are used to relieve stomach acid and, in general, the pains of the digestive system (also to promote elimination of intestinal gas). Infusion can be also used to treat insomnia, inducing sleep (his slightly sedative effect is similar to the common Valerian). Catnip oil is rich in carvacrol and thymol, two compounds with antiseptic properties, excellent adjuvants in bronchitis treatment. The flowers, however, can be used to prepare detergent and deodorant footbaths. Finally, Nepeta Cataria can find space also in the kitchen, as its sprouts enrich salads and its leaves (with mint and lemon aroma) flavor meat and fish. Aside traditional herbal medicine, catnip has many other properties that are good for the hair and the skin. This herb is non-toxic, acidic, antibacterial, antiviral and contains oils with many uses. It’s also known as a specific treatment for irritated skin. The plant is good for washing the face and does not irritate the eyes. Moreover, it removes sebum and specific “oils” or lotions, as sunscreens silicone or even mascara. Don’t use it during pregnancy and lactation. 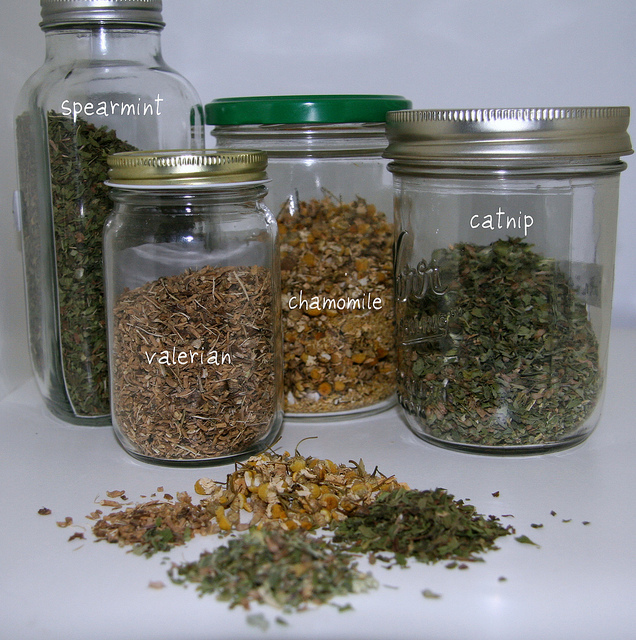 For catnip tea, use 25 grams (about 1 ounce). Boil for a few minutes in a liter (33 oz) of water and leave for 15 minutes. Sift and if you want, you can add honey or sugar. Drink a cup of tea and wait for the effects before you drink more. Catnip can be used along with Galangal, the root of Valerian and Damiana. For the treatment of colds, flu and fever, but also to facilitate digestion, combat flatulence, diarrhea and colic. It also plays relaxant and antispasmodic action to combat insomnia, stress and cramps. It is advisable to pour two teaspoons of dried flowers or two tablespoons of fresh cataria part in two deciliter (6,5 oz) of boiling water. After leaving to brew for five to ten minutes, remove the plant and drink one to four cups a day, preferably between meals. The infusion can also be consumed by children. Use 10 to 15 drops of catnip tincture in a glass of water or a fruit juice, from one to four times a day. The tincture can be consumed by children, in doses of one drop per year of age. From one to two drops mixed with honey up to three times a day. Catnip essential oil is reserved for the consumption of only adults. To fight the pain caused by rheumatism and arthritis. If ingested excessive quantities, Nepeta Cataria can cause vomiting, diarrhea, or headache. In these cases, avoid its use. With the right dosage, consumption of catmint has no known side effects. Please note: this article is for information purpose only. NepetaCataria.org recommends you to run an independent verification or to consult your doctor, before any use. Are you kindly able to suggest me where to find a supplier/manufacturer of Catnip Essential Oil? I would like to test in mosquito repellent. Thanks.